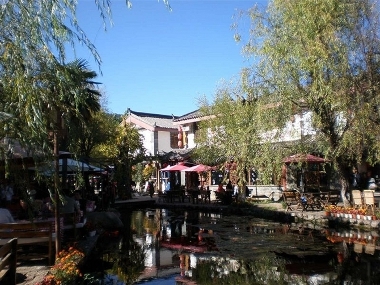 In China, Lijiang is synonymous with "romance". This small old town is located in the shadow of Jade Dragon Snow Mountain (Yulong Snow Mountain). Lijiang acts as magnets and "pull" people into this charming town. I have been to there for two weeks, I spent one day horese riding and another day riding a bicycle. Besides that, I just hid in one of the local hotels and went no where. Everday I sat at the cozy courtyard, enjoy cups of warm Pu'erh (a famous Yunnan Tea) and the lovely sunshine, and talked with other travlers from other places. You really don't need to do anything specific, just kick back and relax. If you are single, then the Lijiang bar street is the best place to have a drink and perhaps get yourself a hangover. :-) You will hear beautiful girls singing the local ballads near that clear river, if you're lucky, they 'may' invite your to have a drink. Lijiang is a kind of spirit - you won't be alone. Nearby: Shangri-la, Tiger Leaping Gorge, Dali Ancient Town, Kunming. How to get there: Flights are available between some major cities of mainland China and Lijiang. Also can catch the overnight train from Kunming to Lijiang. Classic travel route: Yunnan Highlights 9 day Tour. Want to have a fabulous view of the highest mountain in the world? Mt. Everest shows its beautiful north face to every tourists who from Chinese side. Hang up a pray flag under the blue sky, and warm each other in the cold wind. During my last trip to Tibet I witnesed one wedding proposal at Mount Everest Base Camp, they couldn't stop shaking, I guess not only because of the excitments but perhaps was the -15℃ (5℉) on that time. It may take a bit of extra planning, but it's absolutely the best place to proposal - if you want to make it memorable. She will say yes before both of you get frozen. Nearby: Lhasa, Yamdrok Lake, Shigatse, Tingri, Nepalese border. How to get there: Take an overland tour along the friendship Hwy from Lhasa or Kathmandu, the landscapes along the way is worth the long driving. Take a cruise from Guilin to Yangshuo along the Li River, like people always says: the most beautiful scenery is on the way. 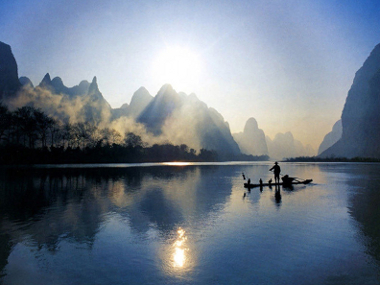 Someone says Li River is the soul of Guilin, and Yangshuo is a shining spark on the west bank of Li River. Along the pure river, thousands of hills stand in different poses and with different expressions, the typical Karst landform makes those mountains alive. Yangshuo town is another place worth to stay for few days. Streets in the town are well kept in the original style, rent a bicycle to explore those small alleys and grap some authentic food for your candlelight dinner. You can find some nice cafes at the famous West Street and have a fresh cappucino to wake you up, but don't be so lazy, because there are lots of interesting acitivities are waiting for you, most of them are with water, drafting is top-rated. Nearby: Guilin, Longsheng Rice Terraces, Li River, Yulong River Drafting. How to get there: 65km (40 miles) from Guilin, around 1.5 - 2 hours driving to Guilin airport. Of course the most classic way is take the Li River cruise. Classic travel route: Classic China Tours. I believe you will find some other great places to visit in the world, love is all around. Quote from one of my clients Julia: "Live and Love with Passion!" Stay in touch and look for my next blog coming soon!